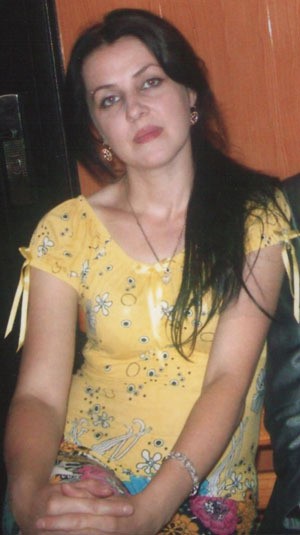 Zalina Elkhoroeva 1980, kidnapped 22.12.2010 г. On December 22, in the village of Chermen, Prigorodny District of North Ossetia, Zalina Elkhoroeva, 30, a resident of the city of Nazran (Ingushetia), was abducted. According to Idris Elkhoroev, on that day his daughter was coming back, together with her daughter-in-law, from Vladikavkaz in a taxi. In the territory of Chermen, near the post KPM-105 of the Ministry of Internal Affairs of North Ossetia (the so-called Chermen Ring), the taxi was blocked by several cars – four armoured UAZ vans and a silver VAZ-2114. Armed persons in masks and camouflage got out of the cars; they ordered (while speaking Russian without accent) everybody to get out of the taxi and present documents. They checked Zalina’s passport and asked her to get into the VAZ-2114. The rest of them were ordered to go to the post and wait there for Zalina to join them. Zalina Elkhoroeva was taken away to some unknown place. About an hour after the incident her relatives filed a written application to the militia station in the Maiskoe village, Prigorodny District of the Republic of North Ossetia-Alania (RNO-A). On the following day, Idris Elkhoroev submitting his written applications to the Prosecutor’s Office of Ingushetia, Department of the Russian Federal Security Bureau (FSB) for the Republic of Ingushetia and the Security Council of Ingushetia. However, until now the whereabouts of Zalina remains unknown. Zalina Elkhoroeva went to Vladikavkaz to visit her younger brother Timur Elkhoroev, who is kept in SIZO (pre-trial prison) there since mid-December. Before that, from November 18 he took his treatment at the Clinical Hospital in Nazran, after unidentified persons had shelled the car where Timur was in the Altievskiy Municipal District of Nazran. The driver of that car was killed. Timur Elkhoroev was presented charges; however, his father says he does not know the details, because his son lives separately from the family; and the now missing Zalina Elkhoroeva had dealt with her brother’s matters.